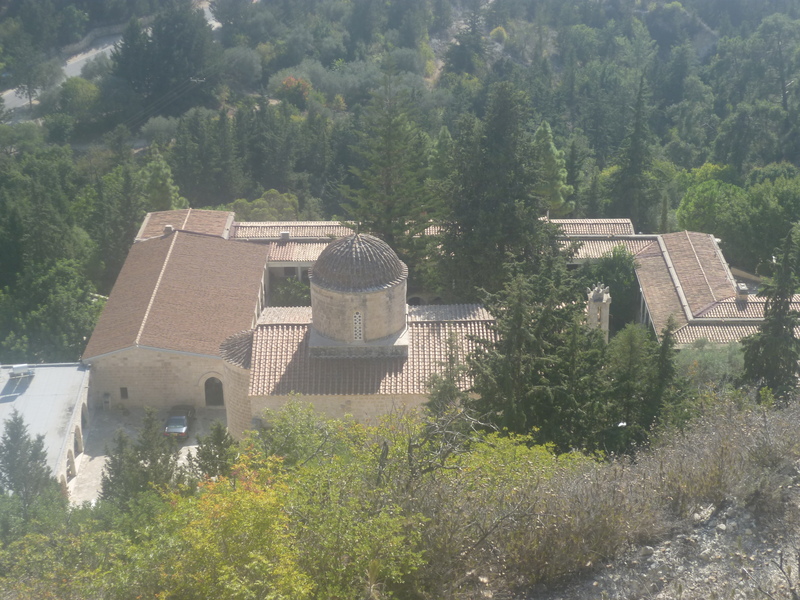 Difficulty: A fairly steep climb at the start and a slightly tricky descent down to Agios Neophytos monastery at the end. Very little shade throughout. 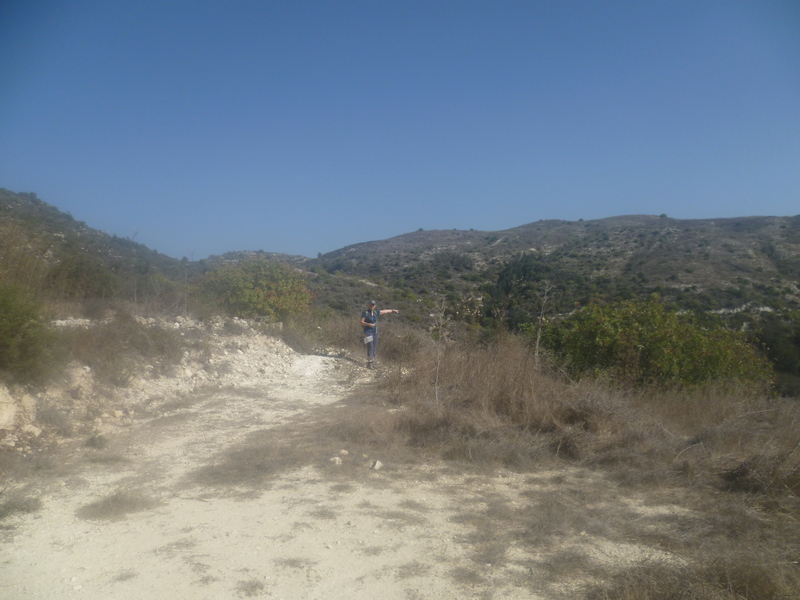 This walk starts from the 12th century monastery of Agios Neophytos, situated just outside the village of Tala and a few miles north of Paphos. The monastery is a well-known tourist attraction – particularly popular with Russian Orthodox visitors – and there is plenty of (free!) parking in the car park outside the monastery walls. 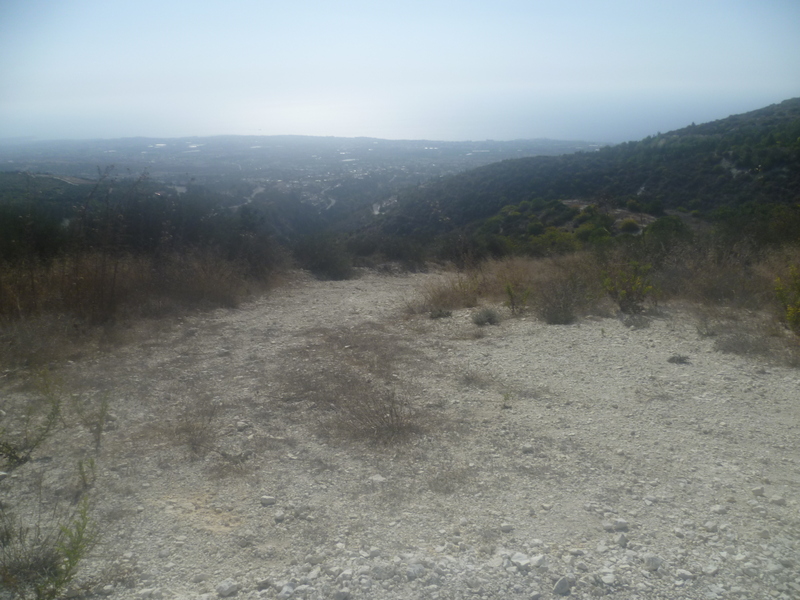 Starting from the car park next to the monastery café head back down the quiet asphalt road towards Paphos. 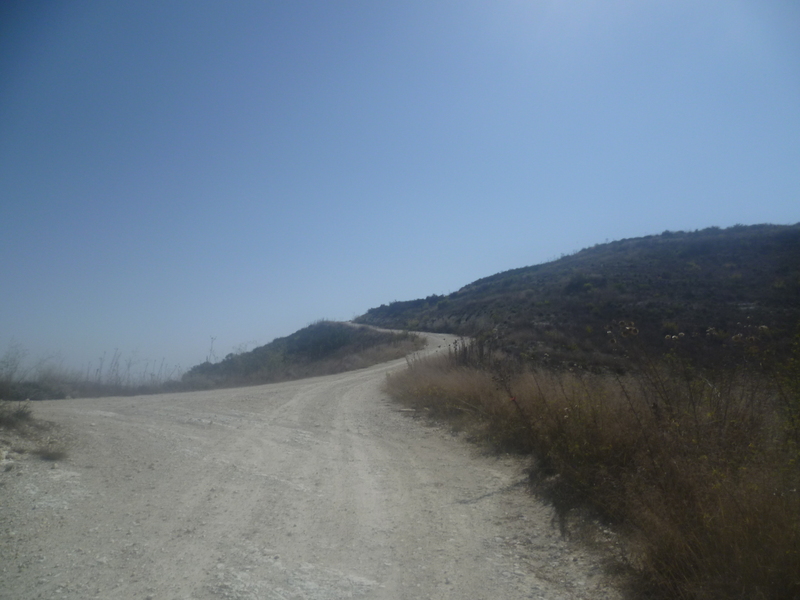 You will pass a right-hand turning down towards Tala after about 100 metres – ignore this and, after a further 80 metres (before an old stone warehouse on your left), turn sharp left up a dirt track (5 minutes). The track climbs quite steeply and you should follow it, ignoring any smaller tracks off to left or right. 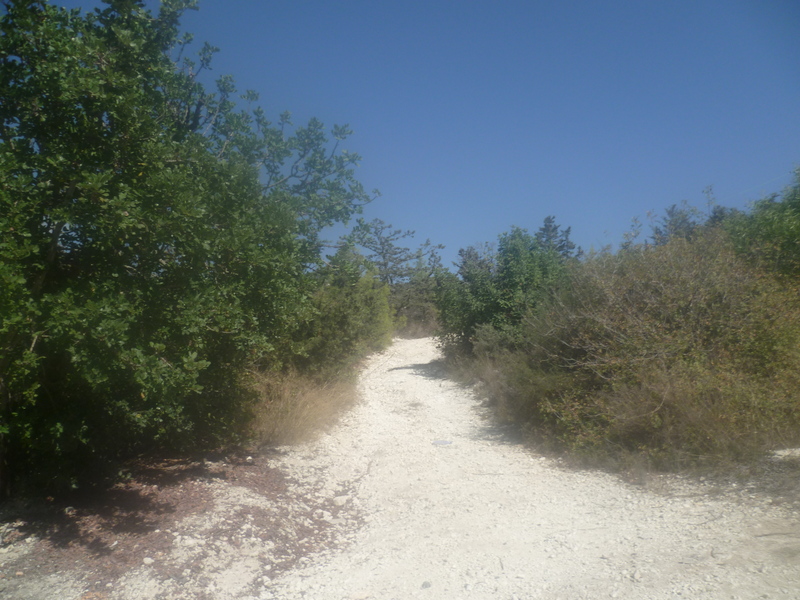 After 10 minutes it opens out into an olive grove and wends it way clockwise around three sides of the grove before coming to an asphalt road. Turn left and walk briefly up this cul-de-sac until it ends just before reaching two houses. 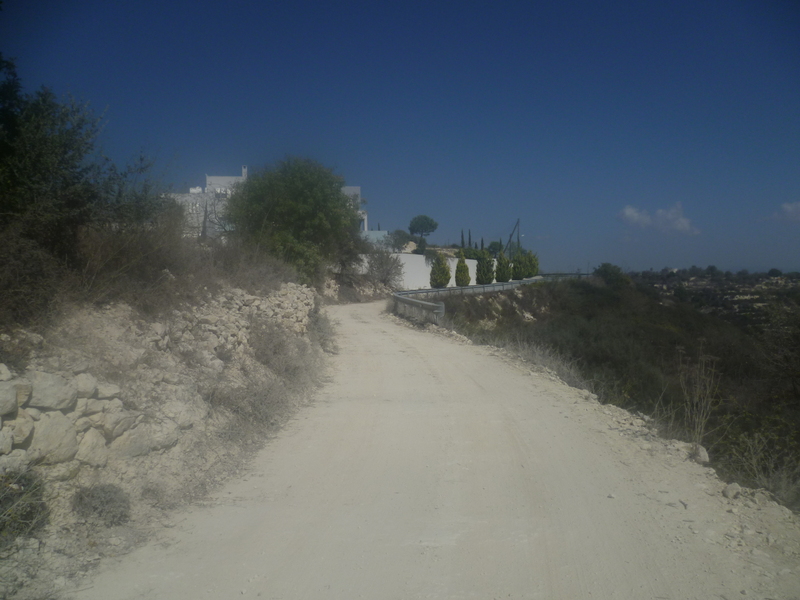 Walk up a low bank at the end of the road, follow a track up towards the houses until it comes to another asphalt road. Turn left here and follow the road for about 30 metres until it degenerates into a dirt track and begins to climb below the summit of Melissovounos. A right turn here offers a short detour up to the radio aerials at the 590-metre summit of Melissovounos. You will of course have to retrace your steps back to this junction when you’re done! Otherwise, turn left at the junction and continue to follow the track uphill until it reaches a crest at around 45 minutes. No more climbing for a while now as the path gently undulates – stay on the track, ignoring any potential turn-offs, as it wends its way towards some houses and turns into a quiet tarmac road. Walk past the houses on your left, then head downhill and around a right-hand bend, passing a further house on your right, before arriving at a junction (1 hour). …and a few yards further on there is a left turn down Archbishop Makarios III Street. 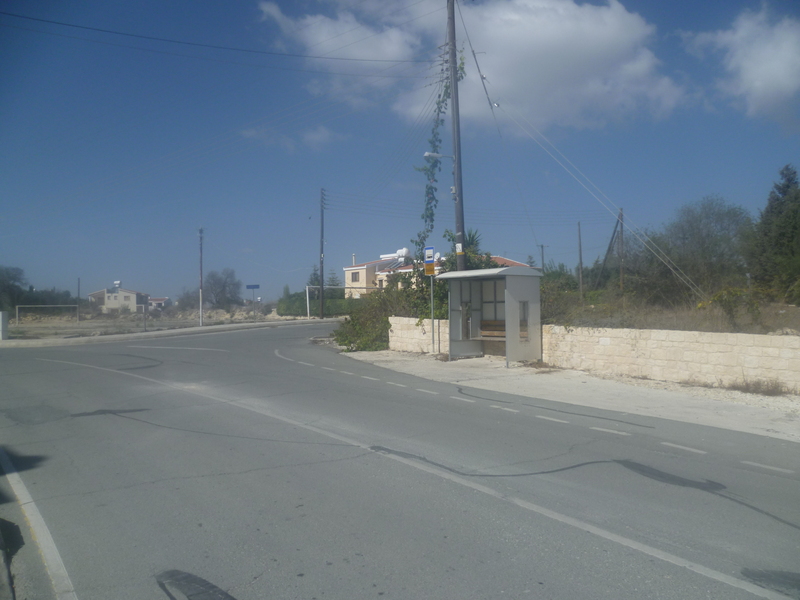 At the time of writing, a blue sign on a telegraph pole opposite this turning indicated (in Greek) the way back to Agios Neophytos. Walk down Archbishop Makarios III Street ignoring the first street off to the right and following the road around to the right. 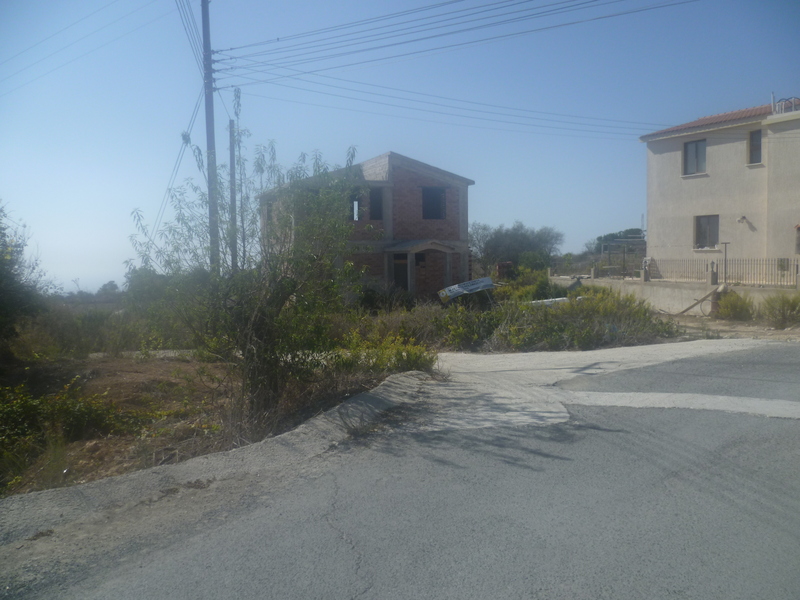 You are walking through what passes for a housing estate in Cyprus – a few pleasant detached houses and a large expanse of open land waiting for possible further development. Follow the road down to a T-junction, turn left into Keryneias Street and, fairly swiftly afterwards, turn right into the next (and only) street, which is unsigned. It’s almost impossible to go wrong here, we promise! You will soon see the Tala road across the valley to your right. 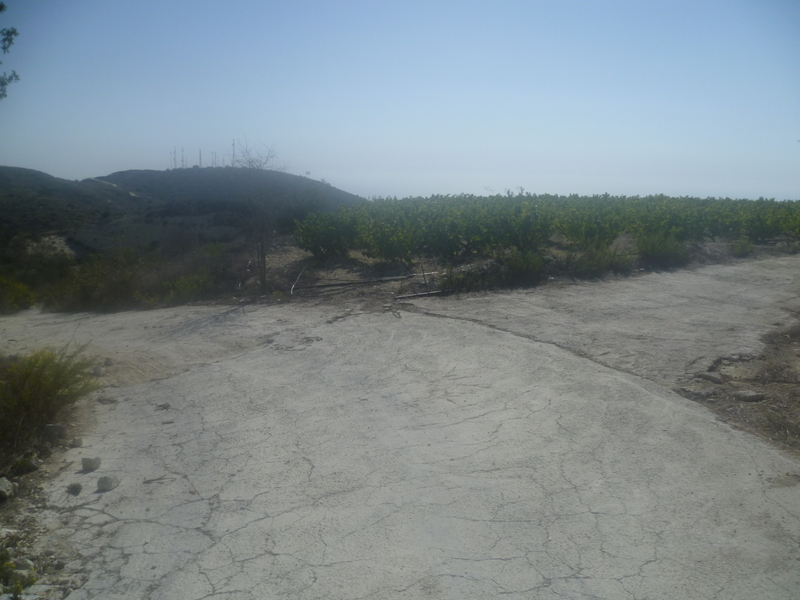 As your route turns 90 degrees left, ignore a rocky path to the right. About 100 metres further on leave the main track and turn sharp right (just before a left-hand bend) onto a downhill track. (1 hour 33 minutes). The pictures below indicate the path downhill. 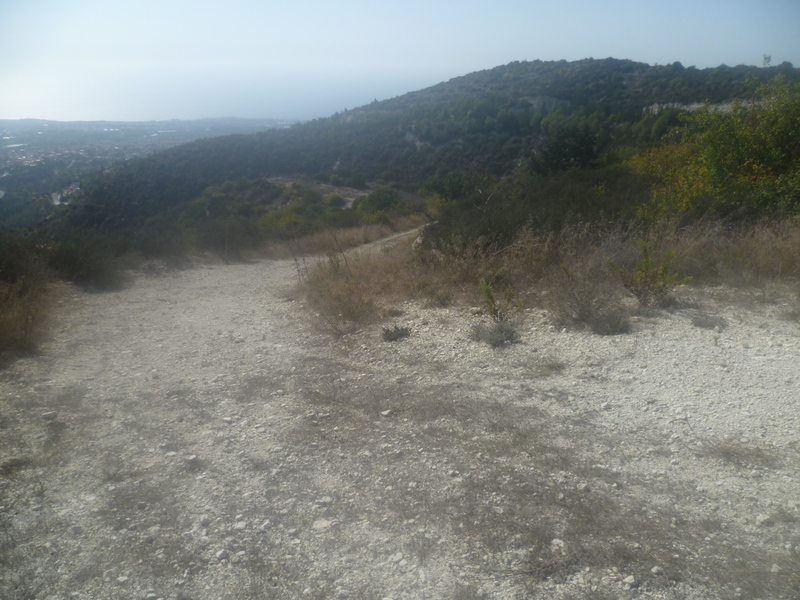 Follow this track for about 300 metres until you reach a hairpin bend down to the right. At this point walk left for about 20 paces to find (perhaps hidden a little among the shrubs at what looks like the edge of a precipice!) a rocky path heading down the hillside to the monastery (1 hour 38 minutes). There is currently an arrow of stones lying on the ground which point to this path. Its precise location is indicated in the picture below. Almost immediately on gaining this path you can see the monastery below you and the path gradually zigzags its way down towards it. This has the feel of an old and well-trodden route pre-dating motorised transport and, we like to think (perhaps fancifully) that you are now walking in the footsteps of monks from many years ago. The path comes out at a water tank at the back of the monastery and it’s a short walk round the monastery walls to arrive back at the car park (1 hour 50 minutes) and, more importantly perhaps, the monastery café! This is a rubbish walk! In that there is lots and lots of fly tipped household rubbish everywhere on the first 45 mins uphill section. Abandoned sofas, chairs mattresses, etc. Tala municipal council should be ashamed of themselves as should Koili as there appears to be a rubbish dump just outside the village. Frank – I feel your pain! 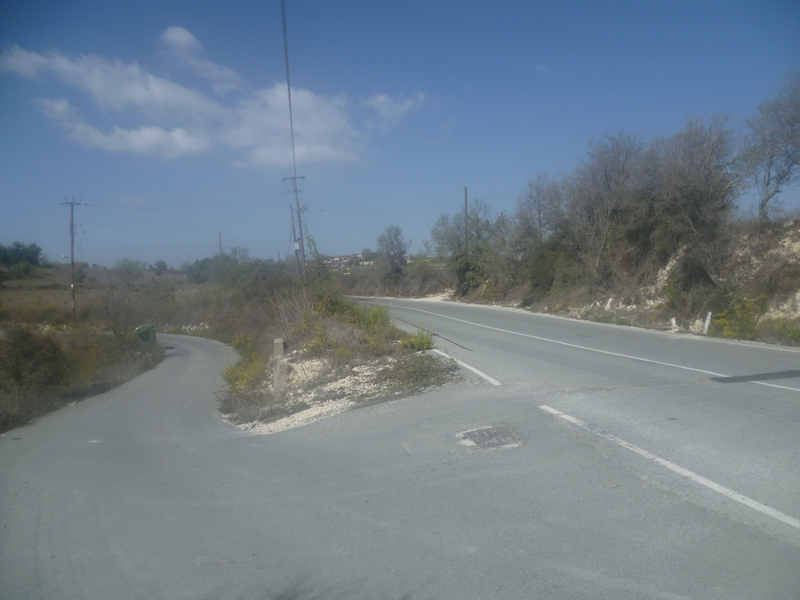 Cyprus is a beautiful island…which makes it all the more baffling that many of its citizens happily spoil it by tipping their household rubbish down the side of scenic hills, valleys and river beds. We find that foreign visitors who enjoy the Cyprus countryside ALWAYS comment on pervasive fly-tipping. There’s no indication that the government or local councils care, sadly. Really great walk, thank you for publishing this. I can confirm everything is as described above! Enjoying an ice cream in the cafe as I type! Thanks Tom – glad you enjoyed it! Looking out of my rainswept window here in the UK an ice-cream in the Cypriot sun seems like a distant memory!